Leaders of medical societies, including ACP, and other stakeholders in the health care industry are looking at broad changes in the health care system to help doctors. Slightly more than half, 54.4%, of 6,880 doctors surveyed in 2014 reported at least 1 symptom of burnout, compared with 45.5% in 2011, according to a study published in Mayo Clinic Proceedings in 2015. Some of the most impacted are primary care specialties, the authors noted, including general internists and family medicine physicians. And the 2016 Survey of America's Physicians, conducted on behalf of The Physicians Foundation in September by Merritt Hawkins, reported that 49% often or always experience feelings of burnout. 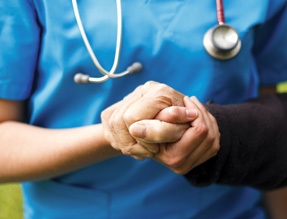 Too often doctors feel like the reason they went into medicine, to connect with and treat patients, is being eroded by other non-patient care tasks, said Marie T. Brown, MD, FACP, a general internist and associate professor in the department of internal medicine at Rush Medical College in Chicago. Leaders at the American College of Physicians and other health organizations and facilities are fighting back, taking steps to assist doctors in better managing their work environments. They are launching strategic initiatives, educational modules, and hospital-based efforts to ease daily strain. Last year, ACP launched its network of ACP Wellness Champions, composed of ACP chapter Governors and physician leaders from around the country who are leading sessions on burnout from diagnosis to prevention. Another ACP initiative, “Patients Before Paperwork,” is looking at broader changes needed in the health system to lighten the non-patient care load. Cynthia (Daisy) Smith, MD, FACP, ACP's Vice President of Clinical Programs, is not a big fan of the term “burnout,” saying it has a victim-blaming connotation, particularly since so many of the underpinnings of the problem are more systemic. ACP's goal is 2-pronged, she said: to better support doctors individually and to push for broader health system remedies. Women appear more vulnerable to burnout than men, according to an analysis of data from 422 family physicians and general internists published in January in the Journal of Primary Care & Community Health. Overall, 36% of women reported at least some degree of burnout compared with 19% of men, according to the findings, based on data from the Minimizing Error, Maximizing Outcome (MEMO) study. The burned-out physicians were more likely to report chaotic workplaces: 75% did so compared with 39% of their counterparts. They also described a lack of work control. Just 4% of burned-out physicians reported significant work control versus 28% of non-burned-out physicians. The study didn't identify any impact on patient care, despite the personal costs of the work environment; however, prior analyses from the MEMO study showed lower-quality care in environments that burned out physicians. Thus the systems that burn out physicians, not the burned-out physicians themselves, may lead to decrements in care quality, said Mark Linzer, MD, FACP, a study author and one of the leading researchers in burnout and physician wellness. “Burnout is a long-term stress reaction,” he said, adding that potential warning signs are numerous, including irritability, fatigue, sadness, lack of interest in work, cynicism, and distancing oneself from patients, among others. Certainly, the pressures on doctors can't be eliminated, said Dr. Linzer, who directs the division of general internal medicine at the Hennepin County Medical Center in Minneapolis. Studies continue to pile up that highlight the cost, both in dollars and practice time, of accumulating documentation and other requirements. One recent study, a time-tracking analysis following 57 physicians, found that 27% of each office day was devoted to patient care and 49.2% was devoted to electronic health record and desk work. When the doctor was in the patient exam room, 37% of the visit was spent interacting with the health record system and doing other desk work, according to the findings, published online Sept. 6 by Annals of Internal Medicine. Another analysis, published in March in Health Affairs, found that doctors and their staffs spent 15 hours per physician each week complying with external quality reporting requirements, nearly 800 hours per practice annually. Tom Jenike, MD, who helped launch a physician resiliency program at Winston Salem, N.C.-based Novant Health in 2013, said he realized that he was struggling himself several years prior to that. He still enjoyed interacting with patients. “But by the end of the day, my tank was empty rather than filled,” said Dr. Jenike, now a senior vice president and the chief human experience officer at the nonprofit health system. At night, he dealt with insomnia, a new experience. He'd lie awake, reviewing a patient visit from that day or thinking of what filled his schedule for the next. “It was really hard to turn my mind off,” he said. The goal of Dr. Jenike and other physicians is to intervene before nagging stressors flare into full-blown burnout. Dr. Linzer was involved with a randomized study, published in 2015 in the Journal of General Internal Medicine, that looked at workplace changes and their impact on burnout. Researchers determined that redesigning the work flow—some steps taken included changing the call schedule and asking medical assistants to enter data into the electronic health record—had the biggest payoff in reducing burnout symptoms among the 135 primary care clinicians. The researchers, who published a table listing some of the work interventions they used, also found that improving communication helped. Some strategies involved monthly clinician meetings to discuss patient care challenges and improved communication within the practice itself. The importance of this has been summarized in the literature as “meetings with meaning,” Dr. Linzer noted. Another recent study, based on site visits to 23 high-performing practices, provided some insights into steps to improve work flow. They included a more team-based approach to care that involved offloading tasks that nonphysicians could handle, wrote the authors in the May/June 2013 Annals of Family Medicine. Adding scribes to the patient exam room reduced the time the physician spent with the electronic health record. Previsit planning, such as scheduling lab work in advance, reduced the time drain of tracking the patient down afterward. Dr. Brown suggested that doctors try ordering the lab work for patients' next visits, say for a diabetes checkup, before they walk out the door. Even if only half of those patients follow through, that will still notably cut the need for follow-up letters and phone calls to report results, she said. Another strategy, discussed in the Annals of Family Medicine study about high-performing practices, involves streamlining prescription renewals for ongoing medications. When the medications a patient takes are synchronized, they can be renewed together. Once they are synced, the doctor can write them to extend 12 to 15 months, even if the patient comes in more frequently for checkups. The American Medical Association's STEPS Forward initiative offers an online module that walks doctors through this process, which the organization argues can be a significant time saver. The initiative uses the example of a practice that treats 1,000 patients with chronic diseases who each take 5 medications. Every year, those patients make 2 medication-related calls, each lasting about 2 minutes. Total projected time savings from synchronization in this example is 333 hours per practice annually. For Dr. Jenike, crossing paths with an executive coach, who happened to be giving his son private baseball lessons, enabled him to turn a corner. As they got to know each other, Dr. Jenike talked about his difficulties. Through a series of sessions, he said, he reclaimed balance in his life inside and outside the office. A lot of the reason he had stretched himself so thin, Dr. Jenike said, stemmed from “my desire to please everybody.” He started shedding nonclinical responsibilities and hired a nurse practitioner, which he calls a crucial step. “Up until then, my ego would say that I was the only one who could take care of these people,” he said. In 2013, Dr. Jenike teamed up with the coach, Nicholas Beamon, to launch the Novant Health Leadership Development Program. Their first group comprised 32 physician leaders at the health system, with a focus on protecting work-life balance and emotional resilience. The 6-month program, which these days includes other clinicians along with physicians, is kicked off by a 3-day retreat offsite that is light on PowerPoint slides and heavy on fostering frank discussions, Dr. Jenike said. After the initial training, there are follow-up sessions and mentoring. To date, roughly 600 of nearly 1,400 doctors at Novant Health have completed the program, and the system has been monitoring its physician engagement scores —the flip side of burnout, Dr. Jenike noted. By 2015, Press Ganey data showed that the engagement level among program participants was at the 89th percentile nationally compared with 62nd percentile among all doctors in the system. At ACP, leaders are taking their message about physician wellness nationwide, building on its cadre of Wellness Champions. Last fall, Dr. Linzer led a 7-hour “train the trainers” session, educating 20 members of the Board of Governors and other ACP leaders about causes and inventions to improve physician health and ease stress. By late summer, those ACP Wellness Champions had held presentations in more than 50 locations around the country, including regional and national meetings for medical groups as well as ACP chapter meetings, according to Susan Hingle, MD, FACP, chair-elect of the ACP Board of Regents, who is leading the effort. ACP also is in the process of putting together a toolbox of resources to be posted online, with sections devoted to various issues ranging from using scribes to optimizing electronic health records to improving team-based care. One goal of ACP's “Patients Before Paperwork” initiative is “to look across in a more comprehensive way and see what we can do to more consistently and cohesively address these issues,” said Shari Erickson, MPH, ACP's Vice President of Governmental Affairs and Medical Practice. In prior surveys and focus groups, ACP members selected 3 top practice-related priorities: electronic health record usability, quality reporting, and dealing with insurance companies. ACP leaders are developing a policy paper tentatively scheduled for release in early 2017, not only looking at research in those areas but also making related recommendations, said Ms. Erickson. Doctors also can exert influence closer to home, making sure that physicians' voices are heard in situations, such as changes in electronic health record systems, that impact their daily practice life, said Dr. Hingle, who is also a professor of medicine at the Southern Illinois University School of Medicine in Springfield. Moreover, when you notice that a colleague seems to have shifted into a negative mindset or see some other puzzling personality shift, reach out, Dr. Hingle said, and don't neglect to extend that same compassion to yourself. Linzer M, Manwell LB, Williams ES, Bobula JA, Brown RL, Varkey AB, et al; MEMO (Minimizing Error, Maximizing Outcome) Investigators. 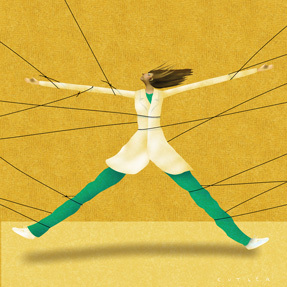 Working conditions in primary care: physician reactions and care quality. Ann Intern Med . 2009;151:28-36, W6-9. Sinsky C, Colligan L, Li L, Prgomet M, Reynolds S, Goeders L, et al. Allocation of physician time in ambulatory practice: a time and motion study in 4 specialties. Ann Intern Med . 2016. Patients Before Paperwork. An ACP initiative intent on pushing for more systemic changes to address electronic health record usability and other practice priorities identified by members, online . STEPS Forward. A series of modules from the American Medical Association to assist doctors in various areas, including professional well-being, technology, and work flow, online . STEPS Forward also includes the Mini Z Burnout Survey , a tool to help assess burnout levels. The Mini Z was developed by Mark Linzer, MD, FACP, and team at Hennepin County Medical Center, Minneapolis. 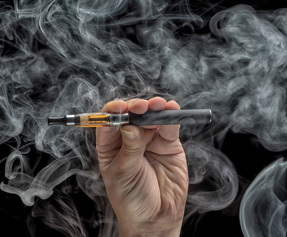 How should internists address e-cigarette use?